Alberto Parada is committed to providing a high quality product that is both environmentally and socially responsible. 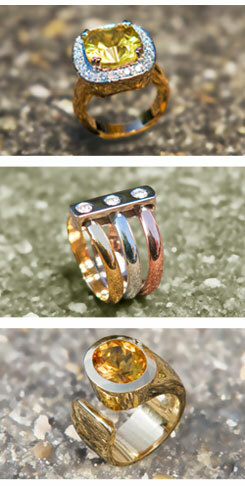 Alberto's jewelry contains only reclaimed gold - Gold from the existing supply chain that is recycled and refined. By choosing to use reclaimed gold, Alberto does not contribute to the environmental destruction, waste, and social injustice caused by metal mining. Alberto is a member of the No Dirty Gold campaign. Alberto's jewelry is handcrafted and manufactured in the United States using conflict-free diamonds and fair-trade gems. In October 2007 Alberto was featured at the first Green Fashion week in Seattle, Washington produced by the Zella Company. Alberto has participated in several charity events including United Cerebral Palsy, Professional Football Players Mothers Association, Under The Baoabab Tree, Fashion Fights Poverty, and California Wildlife Center. © 2007-2014 Alberto Parada. All rights reserved.